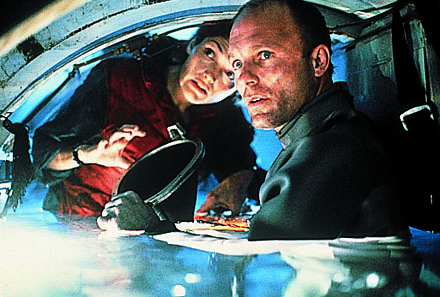 I have never really been a fan of James Cameron’s The Abyss (1989), but as someone who grew up yearning to watch Voyage to the Bottom of the Sea (on at the same time evening worship started on Sundays) and 20,000 Leagues Under the Sea (Disney’s World of Color, same time, different channel), I had high hopes when I went to see it. Not sure anyone emerged from the chilly theater as a fan, but the movie had moments. Most James Cameron flicks do. The one that resonated with me (to the best of my recollection)? Lindsey: Please, listen! Just listen to me for one second. Now you’ve got the suit on, and you’re a much better swimmer than I am, right? Lindsey: Right? Yes! So I’ve got a plan. Lindsey: I drown, and you tow me back to the rig. Lindsey: You tow me back and I can, I can be revived after, maybe ten or fifteen minutes. Ten-fifteen minutes! Virgil: [pushing the suit collar at her] Linds, you put this on, you put it on! Virgil: [putting the collar back on] This is insane. Lindsey: Oh my God, I know. But it’s the only way. Maybe it’s not the only way; after all, I didn’t get to see all of those scientifically-stoked hours of Voyage and Leagues. Maybe it’s just a few hokey moments of pretty good melodrama in an otherwise immemorable movie. But the scene resonsates with me because I have always wondered how the conversation in heaven took place where The Plan was formulated. You know: The Plan. We can theorize and argue all we want to about atonement theories, but when we intellectualize the subject, we fail to to address and experience the raw emotion of The Plan. The Father will have to abandon His beloved Son in ultimate anguish. The Son will have to suffer in indescribable physical pain. And die, trusting the Father who has turned His back on the sin borne by the Son. And the Son must stay dead for three days. And then be resurrected, to a whole new and different kind of body, apparently. Somehow, among all the nice, systematic, logical theories we can muster, The Plan turns out to be the only way. It is the only way we can be revived from asphyxiation while drowning in icy sin. ← In The Name Of …. Hey Bro. Great post, so rich in it’s imagery, the analogies, the parallelisms. It certainly struck a cord with me that’s for sure. God Bless My Friend!! Looking forward to more great articles that challenge our thinking.